Around May 1, 1893 Otto L. Braumuller, president of the Braumuller Piano Company, left the four-story house at the northeast corner of Fifth Avenue and 17th Street for good. His wife, Luetta E. Braumuller, whom he had married in August 1876, remained behind. Perhaps even more well known than her husband, The Evening World called her "an artist of considerable reputation." The editor of China Decorator, she had been awarded several medals at the Chicago World's Exposition where she also gave an address. The newspaper described her as "about thirty-five years old, dresses stylishly and wears glasses. She has sharp, clearly cut features." Luetta held art classes in the Fifth Avenue house. Trouble ensued after an 18-year old friend of her son, W. Earle Holcombe, signed up. It would seem that art was not the only lessons the boy received. Braumuller sued her for divorced, claiming she had become "too friendly" with the teen. Proper Victorian women were no doubt shocked when they read account of the hearing in The Evening World on January 22, 1894. Two of the witnesses were Braumiller servants, who testified "to having found Holcombe's nightclothes in Mrs. Braumuller's room." At the time of the divorce proceedings the neighborhood around No. 97 Fifth Avenue had almost completely changed from one of private mansions to commercial buildings. The Braumuller residence would soon become another victim. Real estate operator Henry Corn was highly responsible for the transformation of lower Fifth Avenue. Working most often with architect Robert Maynicke, he replaced one mansion after another with modern loft buildings. They teamed up again for No. 97 Fifth Avenue. Construction on the building began in 1897 and was completed the following year. The eight-story neo-Renaissance structure was a typical Corn-Maynicke collaboration. Clad in brick with terra cotta trim, it was stately and handsome, but not exceptional. Decorative elements like the striking palm-backed cartouches that adorned the spandrels between each floor, were signature Maynicke touches. The realistic palm frond decorations are typical of Robert Maynicke designs. The neighborhood was home by now to several piano and organ firms--the Fischer Piano Company, Chickering Piano, and Decker Piano among them. Sohmer Piano Company would soon occupy another Corn-Maynicke building at No. 170 Fifth Avenue which had risen simultaneously with No. 97. 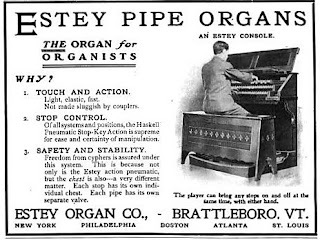 Following the trend, the Estey & Saxe company, Vermont-based makers of pianos and organs, moved into the ground floor of No. 97 Fifth Avenue. In May 1898, there were just two tenants. Both Estey & Saxe and B. L. Solomon's Sons had signed 10-year leases. B. L. Solomon's Sons dealt in "artistic furniture" and "antique coverings" (upholstery fabrics). It offered, for instance, a "full line of railroad plushes" in its new "spacious and elegant salesrooms." A vice-president of Estey was Levi Knight Fuller, a former governor of Vermont. When he died not long after the firm moved into No. 97 Fifth Avenue, he left a unique collection to the firm. On March 25, 1899 The New York Times reported "Collectors have all sorts of fads, but one of the queerest to the average man was that of the late Gov. Fuller of Vermont. His hobby was tuning forks." The 307-piece collection was put on exhibition in the Estey showrooms. Included was an 18th century example by John Shore, who had invented the tuning fork in 1711; and one which had been owned by George Frideric Handel and reportedly used "when he conducted his oratorio, 'The Messiah,' in 1751." There was also a "delicate little fork" used by opera star Adelina Patti during her 1882 American concert tour. A standout was the two-foot long fork used to tuning the lowest notes of the keyboard. Customers to the Estey showrooms browsed among pianos and reed organs--sometimes called "parlor organs." About the size of an upright piano, the reed organs produced music when the operator pumped foot pedals which filled an internal bellows. They were highly popular not only for domestic use, but for small churches. 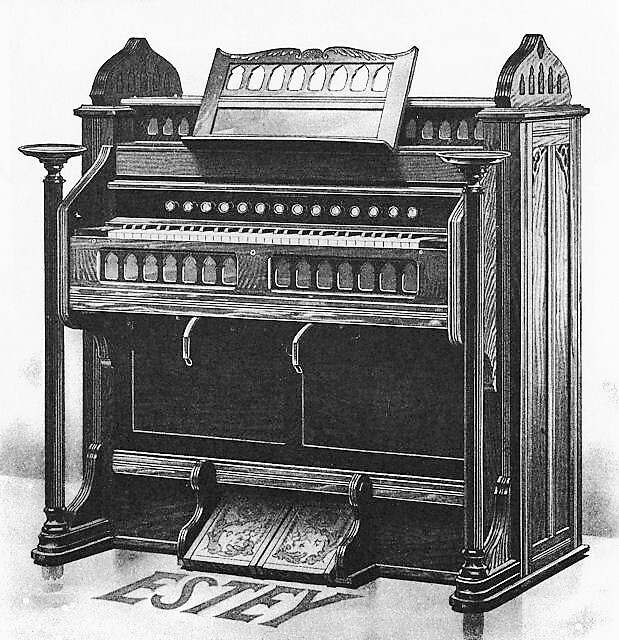 At the turn of the century, however, the parlor organ's popularity began to wane. So the firm turned to manufacturing pipe organs as well. Well-known organ builder William E. Haskell was recruited from Philadelphia to head that operation. 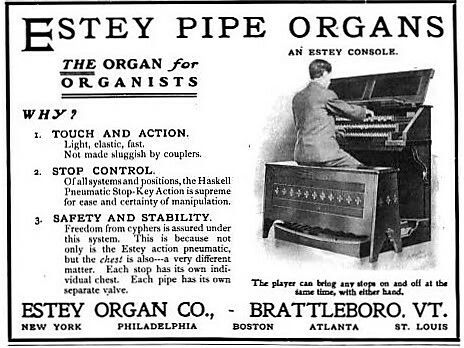 An advertisement in The New Music Review in March 1905 touted the new instruments. 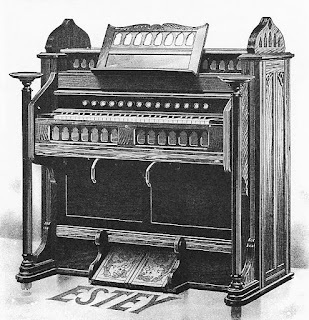 It promised that the "Estey Pipe Organ insures against cheap construction--inside and out, annoying breakdowns, continual repairs...old-fashioned ideas, slot, stiff or noisy action [and] untried experiments." By now another upholstery firm had moved into the Building. Thomas F. Gurray was here by 1901. When Estey moved its showrooms to No. 7 West 29th Street in 1907, the store became home to Flatau, Olesheimeer & Co., "dealers in laces and veilings." Ramer & Lissauer, makers of "neckwear, silks, satins, linings, etc.," moved into the sixth floor around the same time. The two firms would remain in the building for many years. They were emblematic of the fabrics and apparel tenants that would continue to occupy it. The other tenant in 1919, for instance, were Benedick & Bodner, makers of "reefers" (men's jackets); Liondale Shirt Company (which would be a major producer of U.S. Army uniforms shirts during World War II); and R. Goldstein & H. Israel. One non-apparel firm at the time was Wolfson Brothers Umbrella Company, on the fourth floor. A new tenant in 1922 was Brandon Magnus Company, makers of men's handkerchiefs. 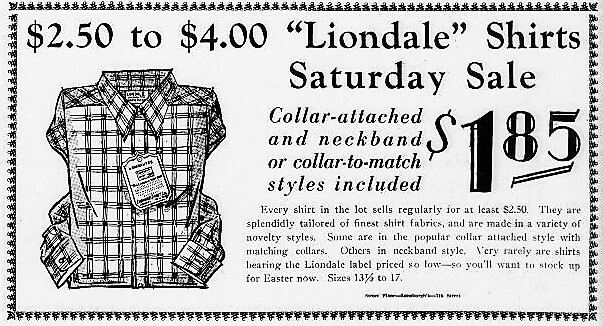 Both Liondale Shirt Company and Ramer & Lissauer were still here. In June 1922 Ramer & Lissauer touted its new ties, still termed "cravats" at the time. The OxWear Cravats were "guaranteed to wear 3 months!" The following year the firm experienced a disturbing incident. Public accountant Harry A. Cohen was hired to audit Ramer & Lissauer's books. Rather astoundingly, on September 8, 1923 The New York Times reported he was "charged with the theft of $500 from Ramer & Lissauer, neckwear concern at 97 Fifth Avenue." The amount, about $7,000 today, seems hardly worth the accountant's professional ruin. In October 1943 real estate operator David W. Frankel purchased the building, assessed at the time at $95,000 (just over $1.3 million today). In reporting on the sale The New York Times forgot about Henry Corn's 1897 purchase of the site, saying that the "Crosby and Delafield families...have owned the property for about 100 years." Although the garment and textile districts had moved north of 34th Street by now, No. 97 continued to house related firms for years. In 1961 two of them, Alscap, Inc. and Lopa of Italy, Ltd. were slapped with violations by the Federal Trade Commission. Both firms represented their Italian-imported fabrics as "wool." They were not. The end of the line for commercial tenants came in 1977 when a conversion resulted in eight apartments on each of the upper floors. Other than an inexplicable coat of paint that obliterates the contrast of materials, even at street level there are few noticeable alterations to Robert Maynicke's 1898 design. The wedge-shaped stones within the course above the first floor reveals the size and location of the original doors and bays. Born in Belfast, Ireland in 1844, Hugh O'Neill was brought to New York as a child in 1844. Following the Civil War he opened a dry goods store near Union Square, but quickly had bigger plans. In 1870 he began purchasing property on the west side of Sixth Avenue, between 20th and 21st Street. Little by little he acquired the entire block front, which he filled in 1887 by his monstrous cast iron emporium, designed by Mortimer C. Merritt. The Hugh O'Neill & Co.'s commercial palace set the tone for what would become known as the Ladies' Mile. Around the corner, the 16th Precinct station house at No. 126 West 20th Street would not survive much longer. Retailers pampered their well-heeled feminine customers with amenities like liveried doormen and stylish lounges. And they did not expect these women to wrestle with hat boxes and packages on their way home. The blocks near Sixth Avenue filled with the stables and warehouses of the emporiums. By 1891 Hugh O'Neill & Co. had demolished the structures at Nos. 124 through 128 West 20th Street and replaced them with a three-story stable. The no-nonsense brick structure had three large truck bays where horse-drawn drays came and went non-stop throughout the day. Rough-cut brownstone trim and a row a brick corbels below the cornice borrowed from Romanesque Revival gave the structure a medieval flavor. By now the O'Neill department store employed a staggering staff of 2,500. The employees working in the stables included drivers, stable boys, grooms, packers, warehousemen, and others. On November 7, 1891 an advertisement in The Sun hinted at the specific jobs performed here. "Experienced Drivers and Harness Cleaners Wanted. Apply at O'Neill's Stables." When Hugh O'Neill died in 1902 retailers were rapidly abandoning the Ladies' Mile and moving northward. The O'Neill operation was absorbed by the Adams Dry Goods store immediately to the north; but by the outbreak of World War I the business was closed. On December 13, 1919 The Sun reported that "The old O'Neill stable property...has been sold. The purchaser is W. K. Rankin, in the trucking business." Rankin paid $100,000 for the building, nearly $1.4 million today. Interestingly, he put the title in the name of his wife, Anna. The following year the Rankin Trucking Co. hired architect George M. McCabe to do $15,000 in renovations. The modifications, including new beams, columns and ramps adapted the building from a stables to what the Record & Guide now termed a garage. Only two years later more improvements were made. In July 1922 architect Louis A. Sheinart made $10,000 in renovations (about $143,000 today), installing a new elevator and concrete flooring, and a "fire-retardant" ceiling. It appears that the Great Depression took its toll on the Ranking Trucking Co. and it was lost to the Greenwich Savings Bank in the mid 1930s. The bank sold it in 1937 to the newly-formed 124 West Twentieth Reality Company. Garage owners of the 20th century were understandably more interested in the functionality of their buildings than in their architectural personalities. The ground floor of the old O'Neill stables suffered brutal alterations over the next few decades. Today only a close inspection of the stonework, obscured by a thick coat of white paint, identifies the openings from which wagons loaded with packages once headed off to the brownstone homes of their female shoppers. Modern amateur historians might wonder why, with anti-British bitterness over the recent Revolutionary War still fresh, developers gave the new four-block roadway between Macdougal and Greenwich Streets the name of King Street. In fact, the name was a tribute to Revolutionary War soldier and member of the Continental Congress, Rufus King. Around 1838 two matching houses were erected on land owned by Trinity Church, Nos. 47 and 49 King Street, just east of Varick Street. Two and a half stories tall and three bays wide, they were faced in red Flemish bond brick. Dormers would, most likely, have pierced their peaked roofs. The elegant but simple doorways, with flanking free-standing columns and leaded transoms, announced that these were erected for comfortable, but not wealthy, families. A horsewalk--or narrow passage--separated the two buildings and led to two small frame houses in the rear yards. William Cleary's metal lintel, installed around 1865, was a somewhat awkward addition. By the first years of the 1850s both houses were leasing rooms. No. 47 was home to James Hendrickson family, and he retained little space for himself. An advertisement in The New York Herald on August 25, 1852 offered "To Let--part of a house in King Street, between Varick and Macdougal streets, consisting of a front basement, front and bank parlor and bed room, on first floor; two attic bed rooms, with several good closets, and large wood house; all in good condition, and respectable locality." A similar ad the following March noted that the "respectable locality" was conveniently "within ten minutes ride of the City Hall. The tenants seem to have been upstanding, like Isaac Robinson Edmonds and his wife, Elizabeth. Edmonds was the General Passenger Agent for the Baltimore and Ohio Railroad, and was politically active. In 1858 had been elected secretary of the Walbridge Democratic Association. The couple had a baby boy in February 1860, but little Isaac Robinson Edmonds did not survive. His funeral was held in the house on the afternoon of February 16. It appears Hendrickson gave up the property two months later. In April 1860 he began clearing out the house. An advertisement in The New York Herald noted "Furniture for sale -- Suitable for a newly married couple about to commence housekeeping. Will be sold cheap. Parlor, bedroom and kitchen Furniture. No dealer need answer this." Among the tenants in the house in 1855 was another real estate man, John Wilson, who was a member of the Suburban Home Association. The group of agents sold land and building plots, like the "highly desirable building site, convenient to the City and easy of access at all times, at a low price and on easy terms," available in May that year. The wooden house behind No. 49 filled with several working class families. In June 1855 one tenant placed an "Situation wanted--by a smart young protestant girl, to do plain housework, or attend to children; has no objection to go a short distance in the country. Can be seen at 49 King st., in the rear." Similar advertisements appeared repeatedly for years, testifying to the sometimes desperate straits of the unskilled occupants. The couple living in the "front basement" in the spring of 1856 apparently lost their infant baby. The mother placed an advertisement in The New York Herald on April 22 saying "Wanted--A situation as wet nurse, by a respectable young married woman, with a fresh breast of milk; is an excellent plain sewer." In 1865 Trinity Church sold both properties to William Cleary. Not long afterward he remodeled the houses, raising their attic floors to full-height and adding modern Italianate elements, like the handsome shared bracketed cornice. No. 47 was widened by extending it over the horsewalk, which now became a tunnel of sorts. Pressed metal lintels were installed over the openings. The delicate Federal-style iron stoop railings and newels of both homes were salvaged. No. 47 gained an extra bay as well as an additional story in the renovations. Cleary demolished the back building of No. 47 in 1870 and erected a "three-story brick tenement" on the site. Five years later, in January, he turned his attention to the back building next door. He filed plans to add an additional story, build a 25-foot wide extension, and alter the front at a cost of $2,000. He continued to operate both properties as rooming houses. In August 1872 he offered the "first floor, five rooms, of nice three story house 47 King street, with gas and Croton water." Among the tenants in No. 47 at the time was 27-year old George V. Queripel, Jr. Henry was a trustee in the American Honduras Company, of which his father was President. Somewhat shockingly, the young man died suddenly on October 23, 1872 and his funeral was held in the King Street house the following Saturday. Less upstanding tenants in 1878 were John C. Richardson, alias Taylor, and Charles H. Tisher, alias Fisher, alias Herman. Detectives broke into their rooms in February that year and arrested them on forgery and counterfeiting charges. The New York Times reported that Tisher and Rirchardson "occupied apartments at No. 47 King-street. There they had type, small presses, dies, engravers' tools, and every instrument necessary to carry on their operations." The pair printed bank checks "so well executed that it would have been difficult to detect them." Detectives were gleeful that they had caught them crooks before they were able to do more damage to local merchants. They told reporters the men were prepared to fraudulently reap a "vast amount." Richardson was described as being between 50 and 60 years old, "5 feet 8 inches tall, with grey hair." But newspapers were more fascinated by Tisher, "a man evidently of German descent, good-looking, well educated, and possessing great ability to deceive. He is about 5 feet 10 inches, tall, has dark hair and whiskers, dark-brown eyes, and a prominent, well-shaped nose." It was not Tischer's "great ability to deceive," which captivated The New York Times, but his "adventures as a 'lady-killer.'" The newspaper wrote "Tisher seems to have been wonderfully successful with ladies of very good social standing, and his papers show that he was mean enough to leave behind him several victims in many parts of the country in which he acted the adventurer." Edward McLaughlin lived in No. 47 by 1890. A skilled laborer, he was known as a "grainer," an artisan who made plaster appear to be marble with his dexterous manipulation of paint and brush. In September that year he headed the movement to organize New York City grainers into a trade union. McLaughlin was successful. In November 1892 he represented the Progressive Painters, No. 6, in the "labor mass meeting" held in Webster Hall to endorse Grover Cleveland for Democratic candidate for President. The Times noted "These men have found out the utter uselessness of the McKinley high tariff for wage workers." A rather colorful resident of No. 49 in 1897 was 28-year old Mrs. Ann Pierce. She was arrested in November that year in Schipper's saloon on the corner of Third Avenue and 35th Street. Highly-respected Assistant District Attorney Philip had been drinking there; when around 9:00 that night Police Officer Emil Geisler was attracted by "a disturbance." The Times reported on November 20, "He found Carpenter throwing beer glasses about and fighting with the bartender, while two loudly dressed women were shrieking and screaming in a corner." One of them was Ann Pierce. Carpenter insisted that the women had stolen his gold watch and slipped it to the bartender. The bartender, in turn, demanded that he pay the several dollars worth of drinks he owed. Carpenter was arrested for the disturbance and the two women were arrested for the robbery. "Their story did not agree with Carpenter's as to how they got acquainted," said The Times. "He says he met them in the saloon and invited them to take a drink. They claim that he accosted them on the street and invited them in." Although Annie and her accomplice were searched and no watch found, they were both held on suspicion. William H. Cleary still owned the properties when in May 1910 he commissioned architect O. Reissmann to do minor updates, replacing the windows and changing interior walls. The renovations cost him about $5,200 in today's dollars. By now the neighborhood had filled with immigrant families; many from Ireland and Italy. The Garibaldi family were living in No. 47 following the end of World War I. On the hot night of August 31, 1922 their 18-year old son, Angelo, became involved in a deadly confrontation. Angelo and a friend, 17-year old Andrew Dana, were walking along Broadway near Houston Street when, according to Garibaldi, Samuel Cohen approached. The 18-year old errand boy was a stranger, but according to their stories, he struck Garibaldi. They started to cross Broadway, but he followed. Angelo then turned and punched him in the chest with his fist. Cohen fell to the street and died in St. Vincent's Hospital a few hours later. The following day Assistant Medical Examiner Vance preliminarily called the cause of death "shock." He said there were "no marks on the body and no fracture of the skull. He was of delicate build" and suggested that he may have had a weak heart. When Angelo Garibaldi and his friend had first walked onto Broadway that night, he could not have imagined the following events would change his life forever. On September 2 The New York Herald reported he was being held without bail on the charge of homicide. Louis Capone lived in No. 47 in 1925. Although listed as a "wood caulking contractor," his obvious wealth and choice of address made his actual source of income suspicious. Also living in the house was his chauffeur, 20-year old Frank Russo. On the night of April 5 Russo drove Capone's touring car to the pier at Vestry and West Streets where the steamship Hamilton had just arrived from Norfolk, Virginia. Russo sat in the car while his boss went on board. Suddenly two gunmen appeared. Russo was forced into the passenger seat "while one of them pressed a pistol against his body," according to The New York Times, "and the other drove to the battery." There Russo was thrown out of the car and the men sped away. In January 1948 the two "three-story apartment buildings and two three-story rear studio structures" were sold to the Kingwood Estates, Inc. Little change occurred until 13 shareholders joined together in 1972 to combine the properties into a cooperative. The apartments in the four buildings were initially offered at prices between $13,000 and $28,000 and included the costs of renovating each to the buyers' designs. As was popular in the 1970s, "almost everyone exposed the brick surrounding their fireplaces," said freelance writer Mary Cantwell in an article for The New York Times. Among the initial owners were Roger Schoening, the art director of Vogue magazine, his wife Carol, a real estate agent, and their two children. They were challenged with squeezing accommodations for all four into the 1,100 square foot third floor apartment. "The Schoenings put a galley kitchen and their living and dining areas into one 20- by 20-foot plant-filled space," said Cantwell. "The children's bedrooms, each only 6 by 8 feet, are separated by an even more minute bathroom, next to which is squirreled a washer and dryer. Although there's not an inch left empty--the housing complex for the children's gerbil, in fact, is a prominent feature of the living area--that's fine with the Schoenings. In their lexicon, small is cozy." Eight years later the couple sprung into action when a detention center of illegal aliens was proposed at No. 201 Varick Street, steps away at the corner of King Street. They fired off letters to authorities like Paul W. Grover of the General Services Administration and Senator Daniel Patrick Moynihan. Carol Schoening's letter to the senator said in part "King Street, and the whole Vandam-Charlton-King Streets historical area, have become strong family, child-oriented blocks. It would be disastrous to have the disruption which must follow the establishment of a detention center in the area." Outwardly the twin houses appear today much as they did at the end of the Civil War when William Cleary gave them a substantial make-over. As the block of West Broadway between Duane and Thomas Streets developed in the first decades after the Revolutionary War, mason and builder Richard Kidney leased several plots from James Morris around 1810. He erected several speculative Federal-style houses, including No. 37, approximately in the center of the block. Faced in Flemish bond brick, the house was three stories tall with a peaked roof which would have been pierced by one or, probably, two dormers. Its sides were clapboard and its splayed lintels were typical of the period and style. Most likely a shop was always at street level. The first occupant seems to have been the family of Peter Carion. What he sold in the store is unclear, since he is listed merely as "merchant." Carion was followed by bootmaker Jacob Knob, and by James Gallgher at least by 1853. While Gallagher described his store as selling "findings" (a term which would later fall away in favor of "notions," meaning sewing supplies like needles, thimble and thread), he spent more advertising money on his real estate business. In February 1853, for instance, he offered for sale "a four story brick house and lot, in Seventh avenue, between Twenty-fourth and Twenty-fifth streets." The sale price, $6,000, would be equivalent to about $192,000 today. Gallagher continued to sell real estate from here through 1860. Interestingly, in February 1858 he was offering the "house and store" just two doors away, at No 41 West Broadway. No signs of Gallagher, his real estate business or his findings shop appear after 1860. A year or so before then the peaked roof was removed from the building. Living upstairs was the Detert family. Herman C. Detert was a member of Troop F, Third Regiment, or Third Calvary. The men were known as the German Hussars. Detert died on July 21, 1859 just 27 days before his 32nd birthday. His funeral was held in the house. In 1861 George Mudeking and his wife, Margaret, purchased No. 37, and moved into the upper floors. Mudeking described himself as a "cigar merchant" and the store as a "grocery." Both terms were diplomatically flattering. In fact, Mudeking operated his saloon here. Six years later, on April 23, 1867, he opened for business as usual. The problem was it was an election day. He was arrested for violating the law prohibiting anyone to "publicly keep, sell, give away or dispose of any strong or spirituous liquors, wines, ale or beer" within a quarter mile of a polling place. By 1873 Mudeking had sold his business to James Rusch. On January 31 that year The New York Times reported that "A fire occurred in yesterday morning in the lager-beer saloon of John Rusch, No. 37 West Broadway, causing slight damage." Rusch ran the saloon until early 1875. An auction was held on February 5 of "the Fixtures of the restaurant and drinking saloon, 37 West Broadway [including] a new patent Range, &c."
Margaret Mudeking, now a widow, had leased the saloon space to Charles Meisinger a few weeks before. His watering hole would last until 1881 when a far different business took over. Caroline West of Brooklyn signed a 10-year lease beginning on May 1 that year. While her name appeared on the paperwork, she most likely had help in running the business from her husband or other male partner. The store was listed as "machinery, tools, horse, wagon, &c."
In 1897 the City renumbered West Broadway, giving Margaret Mudeking's building the new address of No. 135. As the dry goods district overtook the neighborhood by the turn of the century, the store changed personalities again. In 1911 ex-City Chamberlain Charles H. Hyde was facing a charge of swindling a client. Israel Tilden, a law student and clerk, applied for a change of venue, claiming that Hyde was so hated locally that he could not receive a fair trial. To support his application Tilden presented the court with an affidavit alleging that local businessmen had disparaged Hyde, assumed he was guilty, and called him unflattering names. The problem for Tilden and his client was that at least a dozen of the men learned of the affidavit and told reporters they had never made the remarks attributed to them. One of them was Isidore Marcus, whose store was in No. 135 West Broadway. On December 28, 1911 an irate Marcus appeared in court to deny the allegations and attempt to restore his good name. The following day The Times reported he "swore that he had never 'laid eyes on Tilden,' and that it was untrue that he had said 'They stuck me and Hyde and the whole bunch should be shot.'" In 1922 the entire building was taken over by the Star Iron Works. As the neighborhood continued to be more industrial in nature, it later housed Bogen's Express Co. and the Standard Scale Service and Repair. The district around No. 135 saw a transformation in the last years of the 20th century. In April 2011 Matt Abramcyk, formerly the owner of the Greenwich Village restaurant the Beatrice Inn, opened the restaurant Tiny's and the Bar Upstairs on the first and second floors. The top floor became an apartment. Somehow the little house survived more than 200 years of change. The 200-year old house is painted a flamingo pink today. And while nothing remains of its historic ground floor and the peaked roof was lost more than a century ago, it still flexes its residential appearance. In 1888 the Parks Commissioners voted to improve West 72nd Street "with macadamized pavement." Considering the upscale tone of the street, with already more than 60 fine homes and the luxurious Dakota Apartments, the Commissioners agreed to broaden the sidewalks by seven feet, to accommodate the planting of trees and grass. Joining in on the development of the post residential street two years later was developer William Miller, who commissioned William H. Boylan to design four townhouses at Nos. 208 through 214, between Broadway and West End Avenue. Completed in 1892, they were designed in the popular Queen Anne style. Four stories tall above English basements, they were faced in limestone and trimmed in contrasting brownstone. Sharply angled bays, rusticated banding, limestone bracketed cornices and a profusion of stained glass put them on the cutting edge of stylish domestic architecture. Real estate operator William H. Gray purchased Nos 212 and 214, hoping no doubt to make a quick profit. On April 15, 1893 he advertised both houses, describing them as "four-story brown and whitestone houses, with butler's pantry extensions, on full lots, and are finished with all the improvements known to the builders' art." Unfortunately, Gray would not live to see No. 214 sold. Just over six months later, on November 2, The New York Times reported that J. H. Rothschild had purchased the 25-foot wide house from Gray's estate. The $60,000 Rothschild paid would be more than $1.6 million today. Jacob Henry Rothschild had come a long way. His parents arrived among the large German-Jewish immigration of the 1840s. Unlike so many Jewish immigrants who clustered in Manhattan's Lower East Side, they went to Selma, Alabama, where Jacob was born in 1851. In 1860 the family moved to New York City where Samson Rothschild opened a "gents furnishings" store on Broadway. Doing well, he leased half of a two-family residence on West 27th Street in 1868. The other half was taken by the Thomas Marston family. Among the Marston's three children was daughter Eliza Annie, one year older than Henry (by now he preferred to use his middle name more often than his first). Despite both sets of parents disapproving of their romance, the stalwart lovers finally married in 1880; 12 years after they first met. By the time Rothschild purchased the West 72nd Street house he was a highly successful businessman, a member of the cloak manufacturing firm of Meyer, Jonasson & Co.
Now hidden beneath a coat of gray paint, Boylan's use of limestone interrupted by brownstone bands and trim (like the wonderful rope detail) originally produced a stark contrast of white and brown stone. Rothschild's substantial income enabled the family to take a cottage every summer in West End, New Jersey, near the fashionable seaside resort of Long Branch. In the summer of 1893 Eliza was pregnant (quite possibly an unplanned circumstance given that the couple's three children were twelve, nine and six years old). The baby, named Dorothy, was prematurely born in the summer cottage on August 22. Three months later the Rothschilds were moving their things into No. 214 West 72nd Street. Merchant class wealth provided the family with a staff of Irish servants and proper schools for the children. Yet money rarely bought acceptance for Jewish families into mainstream society. With little hope of membership into exclusive social clubs, wealthy Jews had established the Progress Club. Henry was a member of both that club and the more inclusive Criterion Club. In both members wore "club clothes," or evening clothes, and talked business and sports in the cigar smoke filled rooms. In the spring of 1895 Police Inspector William W. McLaughlin suffered humiliation when he was arrested and charged with extortion. He was accused of squeezing Francis J. Seagrist, Jr. for $50 years earlier while he was captain of the First Precinct. As his trial neared in May, a friend, Leo Schlesinger, posted McLaughlin's $25,000 bond; but then he withdrew it. The Evening World explained "It is understood that Mr. Schlesinger's reason for withdrawing from the bond is that he is to be a witness for McLaughlin." He wanted to avoid the appearance of being a biased witness. Henry Rothschild stepped in to free the disgraced officer. His faith in McLaughlin's innocence led him to risk losing his relatively new home. On June 1, 1895 The Evening World reported "He offered as surety the four-story dwelling-house at 214 West Seventy-second street in which he lives." The New York Times added that he had $40,000 equity in the property. Although it took two years and multiple trials, the charges against McLaughlin were dismissed in April 1897 and the Rothschilds' home was secure. In the meantime, although little was heard about Eliza, Henry was visible in Jewish and business activities. He was on the Reception Committee of the Purim Ball in the Metropolitan Opera House on January 19, 1897, for instance. Other moneyed committee members included Isidore Strauss, James Seligman and Adolph Lewisohn. He was a member of the Businessmen's Republican and Sound Money Association, which staged a dramatic demonstration in 1897 in the form of the Sound Money Parade. Rothschild was a marshal, and the official handbook called him "one of the best known manufacturers of cloaks in New York." Little Dorothy was four years old when her life was unexpectedly thrown into shambles. On July 20, 1898 Eliza died in their cottage at West End, New Jersey. Just four months later, on November 28, her father sold the 72nd Street house to Thomas Henry Wheeler. And then, on January 3, 1900 he married Eleanor F. Lewis, described by School magazine as "the former accomplished principal of the Primary department in [Public School] No. 96." Dorothy's tranquil existence simmered into one of bitterness. According to Joan Acocella in her 2008 book 28 Artists & 2 Saints, Eleanor was a "hated stepmother" and "In later years, [Dorothy] rarely spoke of her father without scorn." 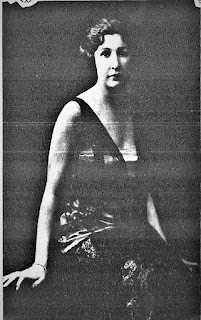 Dorothy married Wall Street broker Edwin Pond Parker II in 1917. Despite her unhappy formative years, or perhaps because of them, she went on to become one of America's best known writers and critics, and a founding member of the famous Algonquin Round Table literary group. In the meantime, Thomas Henry Wheeler had paid Rothschild $62,500 for the house--a mere $2,500 more than Rothschild had originally paid. Wheeler was a vice-president with the Standard Oil Company, having been one of the firm's founders. He had married Celia Roberts, "an accomplished musician, excelling as an organist," as described by The New York Herald, in 1872. Like several other Standard Oil executives, Wheeler had relocated his family from Ohio. The couple had four children, daughters Leita, Stella and Mary Louise; and son Ernest. Celia slipped into Manhattan society, involving herself in charitable works like the Jennie Clarkson Home for Destitute Children. When a benefit concert was held in the Waldorf-Astoria in January 1905, Celia's name appeared on the list of patronesses along with socialites like Mrs. John D. Rockefeller, Helen Miller Gould and Mrs. Harry J. Luce. On April 25, 1905 Leita married Lieutenant Charles Preston Nelson of the United States Navy in the Marble Collegiate Church. It was an impressive ceremony, with the ushers in naval dress uniforms. Following the wedding, a reception was held in the 72nd Street house. Nelson had graduated from Annapolis in 1898. He was already recognized for his roles during the Spanish-American and Philippine-American Wars. But his action during World War I would make him a darling of the press. Commanding a fleet of submarine chasers, he earned the nickname "Daredevil Nelson" and eventually rose to the rank of Rear Admiral. But before any of that happened, it would be Mary Louise's turn to marry. In April 1908 she became Mrs. William Thompson Dewart in the same church where Leita had been wed. The New York Times description of the bride hinted at the family's upscale lifestyle. "Miss Wheeler is a musician, an equestrienne and an accomplished linguist." Once again a reception was held in the Wheeler townhouse. Dewart was vice president of the Frank A. Munsey Company, publishers of periodicals like Munsey's Magazine, and nearly a score of newspapers, including the New York Daily News, the Washington Times, and The Boston Journal. He was, as well, president of the Mohican Company, a department store firm formed with his boss Frank A. Munsey. Thomas H. Wheeler owned the luxurious yacht, the Empress, and the family maintained a "villa" named War-Winett, on Win-Net Island in the fashionable Thousand Islands district. Their names appeared in society columns routinely for their entertaining both upon the yacht and in the summer home. On December 15, 1919 Leita may have shocked society when she divorced her well-known husband. Two months later, on February 25, she and Henry George Pearce, a Philadelphia steel executive, obtained a marriage license. The couple was married in the apartment of Mary Louise and William Dewart in the Apthorp Apartments. The Times noted that the "wedding was a very small one, the bride's only child, Miss Leita Nelson, aged 13, being one of the guests." Like the other newspapers reporting on the wedding, The Times could not help adding "her first husband, Captain Charles Preston Nelson, commander of submarine chasers in the United States Navy, [is] known as 'Daredevil' Nelson." No. 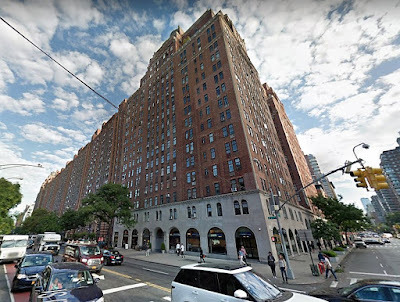 214 West 72nd Street was the scene of an elaborate dinner and reception on May 21, 1922 in celebration of the Wheelers' golden wedding anniversary. The New York Herald remarked that "Some of those present had crossed the continent for the occasion, others coming from distant cities." An orchestra played during dinner, "which was served at small tables," according to the article. The wealthy guests had, of course, provided expensive tributes; and The Herald mentioned one in particular. "Many gifts had been sent by relatives and friends, including a table service of gold and other ornaments." Among those in the house that night was the Wheelers' granddaughter, Leita Nelson, now 16-years old. Two months later she and her mother were staying with the Wheelers at War-Winett. Also at Thousand Islands that summer was the May family, described by The Times as "socially prominent in Philadelphia." The Mays, who had a 20-year old son, William, and the Pearces were good friends. The close relationship let to a romance between Leita and William; one which both families objected to "because of the youth of Miss Nelson and William." On the night of July 25 everyone attended a dance at the Thousand Island Club. When it ended, Leita could not find her daughter. It was soon evident that William May was also missing. Leita called John M. Gibbons, attorney for the New York, New Haven & Hartford Railroad, who went to the garage where the May family's vehicles were kept and found William's speedster was gone. Major Daniel Chandler, a friend of the Wheelers and an organizer of the New York State Police, was notified. While troopers watched the roadways for the car, the Canadian Pacific Railroad was called. Gibbons had heard at the garage that the runaways had asked directions to Montreal. Just before dawn the following morning, the roadster was spotted just outside of Montreal. Leita, Mary Louise, and a friend, Mrs. J. Christie headed off to Monreal to "have a talk" with the younger Leita. Once again, in reporting on the elaborate process that led to upsetting the elopement, newspapers brought up the colorful and heroic Nelson. "Her father [is] Captain Juggie Nelson, U. S. N., who was decorated by Italy, France and England during the war," noted The Times. 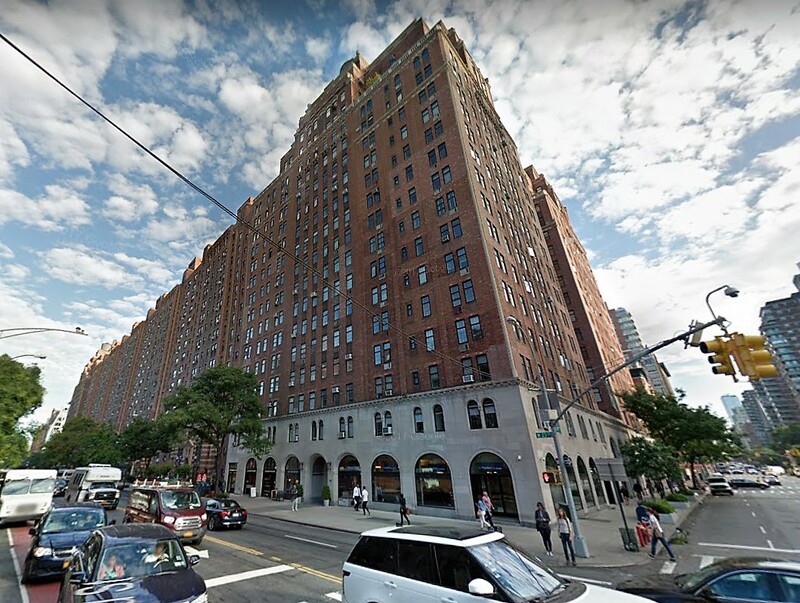 By the time Thomas Henry Wheeler died in 1926, West 72nd Street, once among the most exclusive of Upper West Side thoroughfares, had been heavily changed by commerce. Two years later No. 214 was converted to a store at ground level, offices on the second floor, and eight "non-housekeeping apartments" (meaning they had no kitchens), on each floor above. Only the three upper floors of the facade were left relatively untouched. The address, once home to two wealthy families and their staffs of servants, would never again appear in society columns. It would have one more recognized resident, however. Gerard Alphenaar had been organist in St. Bavo Cathedral in Haarlem in his native Holland and a guest conductor of European orchestras. He and his wife, Beatrice, immigrated to New York City in the 1930s. In 1940 he became organist at the West End Collegiate Church. Four years later he became director of the concert department at the Edward B. Marks Music Corporation on West 52nd Street as well. By the early 1960s the couple was living at No, 214 West 72nd Street. On Sunday, February 7, 1965 Alphenaar had just completed playing a service in a Bronx church when he suffered a fatal heart attack at the age of 65. Today the Rothschild house, where one of America's best known writers and brilliant wits spent her early years, has a nail salon and a massage studio in the lower two floors. The end of the road for the only surviving house of Boylan's 1893 row, however, is on the near horizon. In December 2017 plans were filed for a 21-story mixed use building proposed to rise 219 feet above Broadway and 72nd Street. Retired British Army Captain Thomas Clarke was 53 when he married Mary Stillwell in 1745. His bride, who came from an aristocratic family, was reportedly not especially pleased when her husband decided to take her and their young daughter, Charity, to America. The upper regions of Manhattan were dotted with country estates--many owned by British officers, others by wealthy merchants. In 1750 Clarke purchased nearly 94 acres from Jacob Somerindyck. The deed was quoted in The New York Times later as "all that farm or plantation in the Bassau Bowery on the West side of Manhattan Island, bounded on the west by the Hudson River, on the east by land of John Horn, on the north by the land of Widow Cowenhoven and Brandt Schuyer, on the south by land of Sir Peter Warren and Yellis Mandeville." The bucolic residence, like all Manhattan's elegant country estates, was surrounded by orchards and gardens. Its location atop a hill provided relief from summer heat. Mary, who was known as Molly, was known as a gracious hostess and entertained often. Among the frequent guests would be Rev. Benjamin Moore, who was assigned to Trinity Church and its chapels around 1772. By 1774 Thomas and Mary Clarke had five children. In February that year tragedy struck when Chelsea House caught fire. The family escaped, but Clarke was severely burned. He was taken to a neighboring farm where he survived. He died about 1777. By then he and Mary had rebuilt Chelsea House, this time using brick and stone rather than wood. Two stories tall, it was an elegant Georgian style structure with a central, angled bay and flanking wings. As war swept over the island, Mary remained in Chelsea House. According to historian Alexander Scala, of her four children still living--Charity, Mary, Maria Teresa and Clement--only the last two still lived in the house in 1776. Soldiers were billeted there; apparently much to the discomfort of the two women. According to D. T. Valentine decades later, it "caused them so much distress that one of the officers represented their situation to General Washington, who thereupon rode to the house, upon his white charger, and gave orders by which the family were relieved." Valentine's account included an anecdote which shed light on Mary's refined upbringing. "While the American troops were there, a British vessel, sailing in the Hudson, fired a ball, which lodged in the house, but hurt no one. It left a mark, which remained for years, in one of the partitions. Mrs. Clarke was, at the time, from home. As she was returning, in her chaise, a Yankee soldier met her and said, 'Mrs. Clarke, the British have fired a shot into your house.' 'Thank you for that,' she said." When the British occupied the island, Hessian soldiers were stationed in the house and on the grounds. Valentine noted that their commanding officer "proved to be so gentlemanly and polite that he became a favorite with the family." He told them that he had heard of their dread of him and that he was determined to prove "the injustice of their apprehensions.'" On April 30, 1778 Charity and Rev. Benjamin Moore were married in Trinity Church. The newlyweds moved into the Chelsea house with Charity's mother and sister. The following year, on July 15, the couple had a son. He was christened Clement Clarke Moore on August 11. Mary Stillwell Clarke died in 1802 and Chelsea passed to her son-in-law. Moore expanded the estate, purchasing land south to 19th Street. Following his appointment to Bishop of New York in 1813, he and Charity deeded the property to Clement, although they remained there until their deaths. 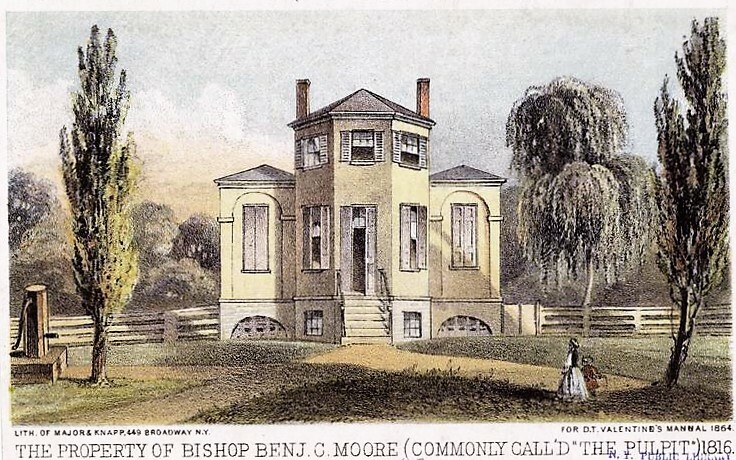 Clement Clarke Moore had been tutored by his father, who instilled in him a love of literature. He graduated from Columbia College in 1798 and was a scholar in Greek and Hebrew. On November 20, 1813 Moore married Catherine Elizabeth Taylor. Prior to the Bishop Moore's death in 1816, the family house was enlarged, Valentine noting "the old house had a third story added to it, cellars built under the old foundation, and the whole square was walled around." The result was an impressive mansion with a hip roof and high porch. But the end of the era of luxurious country houses in Manhattan was quickly drawing to a close. 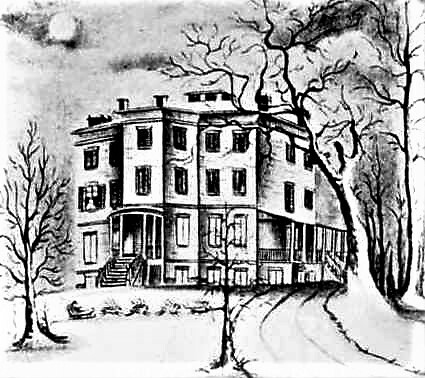 Clement Clarke Moore's daughter, Mary, created this sketch of the family house in 1855, which clearly shows its Georgian bones, including the faceted bay. Two years after his father's death, the city was inching towards Chelsea. According to The New York Times on April 17, 1904, "Presently [after the bishop's death] the good Clement C. was much annoyed by boys and adolescent hoodlums, who came out from 'the city' to depredate [sic] his vines and fig trees. The annoyance became intolerable insomuch that he started one day into 'town' determined to rid himself of the annoyance by dispossessing himself of the estate." Intending to sell the entire estate for $40,000 (about $780,000 today), his plans were upset when he ran into builder James N. Wells, according to the article. "On his way to consummate this suicidal transaction the good, unworldly man met an acquaintance of his, a carpenter named Wells, and confided to him his intention. Nay, said the well-counseled Wells. Do not part with the farm. Lay it out in streets and city lots corresponding to the 'system' (the Street Commissioners of 1807 had already got in their deadly work) and invite settlers." It was the beginning of a long-lasting business relationship between the two men and the end of Chelsea as a private estate. In 1825 he donated his apple orchard (66 tracts of land) to the Episcopal Church as the location for its General Theological Seminary. He was appointed professor of Bible learning in the new institution. 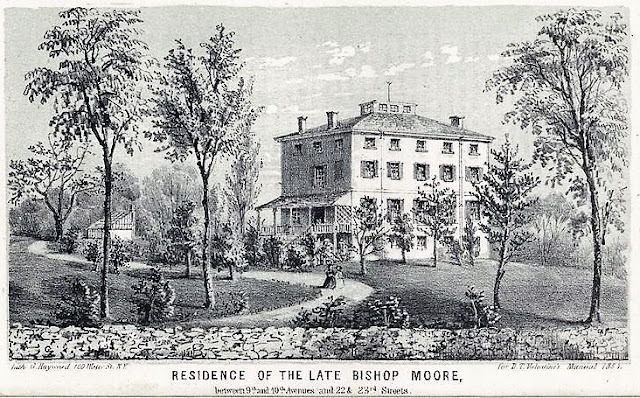 As the flurry of development took hold on his land, Moore moved his family to Elmhurst, Queens. But the move did not happen before he wrote his now-famous poem, "The Visit of St. Nicolas." A century later, on December 19, 1926, Eunice Fuller Barnard wrote in The New York Times, "This verse he is said to have composed in 1822, at his father's imposing tree-shaded country house in old Chelsea Village, at the corner of what is now Twenty-third Street and Ninth Avenue. He did it, he told an interviewer from the New York Historical Society forty years later, simply as a Christmas present for his two daughters, making St. Nicholas the hero at the suggestion of 'a portly, rubicund Dutchman living in the neighborhood.'" Moore's relocation did not mean he disappeared from Chelsea. He closely worked with Wells, maintained his post in the General Theological Seminary until 1850, and was highly involved in St. Peter's Episcopal Church on West 20th Street. 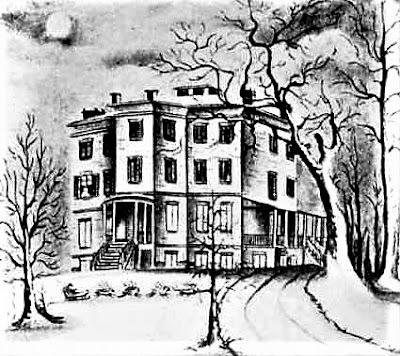 The end of the Chelsea House came when the city graded the area hills, including the one under the mansion, in the early 1850s. D. T. Valentine explained "So the place remained until the Corporation of the city ordered a bulkhead to be built along the river front. It was thought advisable, if not absolutely necessary, to dig down the whole place, and throw it into the river; when, of course, the old house was destroyed." The handsome dwelling at No. 41 King Street was similar to its neighbors that arose on the block in the 1830s. Faced in Flemish bond red brick, it was an ample 23.5 feet wide. Two and a half-stories tall above an English basement, it was originally home to merchant class families. The owner in the first years of the 1850s ran a grocery store at the northeast corner of Thompson and Houston Street. But in 1855 the family decided to give up city life. The "first class grocery" which was "now doing a good business" was offered for sale for $1,500. The advertisement noted "reason for selling, the owner going into the country." No. 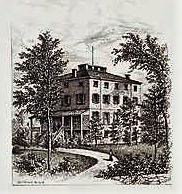 41 became home to three brothers, Samuel, William W. and Andrew L. Roberts. The young men's business enterprises were not nearly so upstanding as their predecessor. Samuel ran the Oyster Bay saloon at the corner of Spring and Mercer Streets; and his brothers operated another saloon on the corner of Broadway and Leonard Street. But their actual source of income was even less reputable. In October 1860 Captain Walling of the "Detective Police" was tipped off that the house held a counterfeiting operation. On October 30, armed with a search warrant, three policemen entered the house. One, Officer Bennett, wanted to make sure no one escaped through the rear, so he opened the door he thought would lead to the yard. "He was surprised to find that it opened into an extension-room where Andrew Roberts had been apparently at that very moment engaged in the manufacture of the worthless bills," reported The New York Times. A search of the house turned up several packages of counterfeit bills, mostly in $10 denominations, copper printing plates and two presses. The fake bills totaled nearly $4,000--about $120,000 today. Genuine bills were also found which had been "altered by a skillful hand." Police arrested Samuel in his saloon on the suspicion of being a partner in the operation. The Times reported "It is supposed that the prisoners have been engaged for many years in the pursuit of altering genuine bills." Robert and William were soon charged with an even graver crime. They were linked to the April 1860 Adams Express train robbery on the New-Haven Railroad, along with Lewis Stebbins and Porter Kellogg. On the first day of their trial, January 9, 1861, a reporter for The Times deemed them "as respectable looking a quartette [sic] as one would wish to see, in or out of a dock. All of them sport whiskers and moustaches, and their ages range from 26 to 35." The haul, consisting of cash, promissory notes, checks and a gold watch, amounted to $25,060--more than three-quarters of a million in today's dollars. According to the testimony of L. A. Kinney, whom the crooks had contacted to help crack open a small safe they took with them, the group met several times in the King Street house to divvy up the loot and plan their next moves. He said in part "I saw Roberts the next day at his house, where we counted the money [from the safe], and found that there was between $10,000 and $11,000." Samuel Roberts was discharged by the judge on the third day of testimony. Judge Smith said there had been no evidence offered to implicate him in the robbery. Nevertheless, he was not out of hot water. The Times reported "After the discharge of Samuel W. Robert, he was immediately rearrested by Officer Bennett on a requisition from the Governor of New-York on a charge of counterfeiting." Not surprisingly, it was the end of the Roberts brothers' occupancy of No. 41 King Street. The next family was affluent enough to hire a live-in nurse. By 1864 the child was apparently old enough that her services were no longer needed. On May 24 and advertisement in The New York Herald announced that "Mrs. Lovell, Ladies' Nurse" was now available. Saying that she had been "educated in two of the first lying in hospitals in Europe, and has had 25 years experience," she gave the King Street family as a reference. "Can be heard of at 41 King street, near Varick street." The family was looking for a maid in July 1866 when it advertised for "A girl wanted--To do general housework, in a private family; one that can come well recommended." It is unclear whether it was the same family in the house three years later when spare rooms were first rented. On July 10, 1869 an ad offered "To let--in private house, 41 King street, a room and two bedrooms, to a family of two or three adults. Rent $18." The last of the advertisements for rented rooms appeared in the spring of 1872. Shortly after the house was purchased by George W. Lithgow, a builder and contractor. He and his wife, the former Frances Richmond, suffered tragedy when their only son died of "membranous croup" on the morning of June 3, 1874. St. Clair Douglass Lithgow succumbed a month before his second birthday. The toddler's funeral was held in the house the following afternoon. The couple would go on to have five more children, daughters Ella Gertrude (who went by her middle name), Lillian and Mabel; and sons Howard and Leslie. As the family grew, in Lithgow enlarged the house. In March 1887 he filed plans to raise the attic to a full height, add a three-story, 10-foot extension to the rear, and do "other alterations." The $1,200 construction costs (a little over $26,000 today) would have been significantly higher had Lithgow not done all the work himself. The remodeled house was up to date with its bracketed Italianate cornice and modern double doors. The parlor windows were extended to the floor. Interestingly Lithgow did not bother to modernize the delicate Federal style iron stoop railings and newels. Lithgow updated the windows and doors, but left the Federal railing with its acorn finials. In 1881 Lithgow co-founded the New-York Real Estate and Building Improvement Company. The new firm listed its purposes as "to own and improve real estate." The family were members of the Fourth Avenue Presbyterian Church, where George was a deacon. It quite possibly this connection that eventually resulted in Gertrude's marriage to Rev. Abraham Woodruff Halsey on March 3, 1893. Halsey had been the pastor of the Spring Street Presbyterian Church for 11 years. The New York Times reported "The Rev. Mr. and Mrs. Halsey will sail this morning on the Kaiser Wilhelm II for Genoa with a three months' tour in view that will include all the interesting points of Egypt and Palestine and much of Europe." The following year The World embarked on a fund raising drive to provide Christmas trees to impoverished children. Mabel Lithgow and two other neighborhood girls, Elizabeth Gilmartin of 36 King Street and Clara Ode of 24 Charlton Street went door to door for the cause. They proudly collected $6. George, who was appointed a School Trustee in 1895, continued to operate his contracting business at least through 1904. In the meantime, Gertrude and A. Woodruff Halsey (he had stopped using his full first name) lived in the King Street house as well. Halsey had become secretary of the Presbyterian Board of Foreign Missions in 1901. Gertrude accompanied her husband on his exotic missionary trips, including one to the west coast of Africa in 1904-05. When the Presbyterian Union held its first winter meeting at the Hotel Savoy in October 1905, Halsey gave an "illustrated address entitled 'Snapshots in Africa,'" as reported by the New-York Tribune. The newspaper explained "Mrs. Halsey took a number of photographs from which stereopticon views have been made" and added "The music will be furnished by Henry P. Burleigh, the colored barytone [sic] of St. George's Church." George Lithgow died on January 30, 1906 at the age of 67. His funeral was held in the house two days later. Frances lived three more years, dying in the house on April 23, 1909 at the age of 65. Her funeral was held in the parlor three days later. The Halseys lived on in the house, along with Lillian who was here as late as 1910. Rev. Halsey continued to be a visible figure in the Presbyterian Church and in the Board of Foreign Missions. He made headlines in 1914 when he traveled 1,2300 miles in the Near East visiting missions and schools established by the Board. He died in the King Street house on April 20, 1921 at the age of 68. In reporting his death, the New-York Tribune pointed out, "Dr. Halsey was president of Woodrow Wilson's class at Princeton University." Gertrude continued to live at No. 41 until her death on November 12, 1945 in Bryn Mawr, Pennsylvania, following a brief illness. She was 78 years old. Her funeral was held in the First Presbyterian Church on Fifth Avenue two days later. The house became home to Philip Olin Keeney and his wife Mary Jane, who moved in in 1947. It was the time of the Red Scare--when hysteria over the perceived threat posed by Communists and the Soviet Union launched intense Senate investigations which many perceived as witch hunts. The Keeneys were directly in their sights. Both librarians, they were members of the liberal group The Progressive Librarians Council. Mary Jane had worked at the Board of Economic Warfare in Washington D.C. and Philip handled classified materials in the Library of Congress. On April 5, 1949 a process server arrived at No. 41 King Street "calling for the appearance of Mr. Philip O. Kenney" on May 10. It was followed up on May 2 by a telegram from the House Committee on Un-American Activities "directing him to appear before the House Committee." In the meantime, Mary Jane was under suspicion of passing information to the Soviet Union. Both testified before the House of Representatives Committee on June 9, 1949. When asked if he were a member of the Communist Party, Kenney replied "I refuse to answer that question on the ground that it may tend to incriminate or degrade me." In fact, he responded to many of the questions with the same phrase. Although Mary Jane purported that she was not a member of the Communist Party, she proudly confirmed that she was the author of the 1939 article in Black and White magazine entitled "The Making of a Radical." Both were convicted of contempt of Congress for refusing to answer questions. Despite their alleged connections with what was called the Silvermaster Spy Ring, they were not charged with espionage. Now without jobs, they opened the Cinema Club on Sixth Avenue and 9th street, to screen foreign language films. By the mid-1950s the house was converted to apartments--a duplex in the basement and parlor floors, and two apartments on each of the upper stories. Among the first tenants were writer and editor Philip H. Dunaway and his wife Lillian. While he was known for his editing of biographies, he had also held a number of Government jobs. In 1939 he headed the editorial and research staff of the Senate Railroad Investigating Committee, of which Senator Harry S. Truman was a chairman. In 1942 and '43 he oversaw the project operations staff of the Office of Foreign Economic Administration, and the following two years was chief editor of the research and analysis branch of the Office of Strategic Services. In 1988 well-known literary agent Charlotte Sheedy purchased No. 41 for $1.1 million. When she sold it to rare coin dealer Louis DiLauro in 2004 there were two duplexes in the main house and two one-bedroom apartments in the rear extension added by George Lithgow. Sheedy made a tidy profit, selling the house for $3.3 million. DiLauro announced he would live in one of the duplexes and continue renting the other units. In 2017 plans were filed to reconvert the house to a single family home. Ongoing construction in December appears to be a gut renovation. The exterior, on the other hand, is little changed since George Lithgow made his own dramatic make-over in 1887. Already the epicenter of Manhattan's artistic community, in the mid-1920s Greenwich Village gained additional notice for its off-Broadway theaters. In 1925 two Federal-style houses at Nos. 22 and 24 Grove Street were demolished by the Opera Players, Inc. They commissioned architect Harrison C. Wiseman to design their new 290-seat theater. Upon its opening, Theatre Magazine reported "The name of the new house is the Grove Street Theatre, and it is the third of a triumvirate of intimate theatres erected in recent years in Greenwich Village, the others being of course the Greenwich Village Theatre and the Cherry Lane Theatre." The ambitious endeavor would not survive for long. Many theater-goers were no doubt shocked when, on January 10, 1929 The New York Times reported "The Grove Street Theatre, a modern three-story structure erected about three years ago as an intimate playhouse, is to be replaced by a six-story apartment house." The property had been sold to Asher Osterman, who announced the replacement structure would contain 42 "studio suites." The developer hired the 32-year old architect Hyman Isaac Feldman to design the structure. Feldman, who went professionally by his initials, had started his practice just eight years earlier. He would soon become well-known for his Art Deco apartment houses along the Grand Concourse in the Bronx and similar buildings in Brooklyn. Before his death in 1981 he would design more than 2,500 metropolitan area apartment buildings. The Grove Street Theatre was not demolished until April 1930; the long delay possibly due in part to the onslaught of the Great Depression. The financial disaster was perhaps also responsible for the scaled-back decoration of Nos. 22-24 Grove Street. The completed six-story building was, overall, nearly spartan. Faced in sandy variegated brick, Feldman relied for the most part on contrasting brick bandcourses and panels to embellish the facade. But he let loose his Art Deco passion at the entrance and on the top floor. The single-door entrance sat within in a lush terra cotta stylized waterfall. Directly above the door a bright green and russet fountain or plant rose to a charming canopy in the form of a Juliette balcony. A colorful band of fans ran along the roof line, and a striking Art Deco ornament of scrolls and flowers decorated the sixth floor. The building filled with middle-class professionals like retired advertising executive Francis W. Hargitt who was here in the late 1930s and early '40s, and author George W. Seaton. The writer was best known for his travel books, like his 1938 Let's Go to the West Indies, his 1939 What to See and Do in Scandinavia, and What to See and Do in New England, published in 1940. When World War II broke out in Europe, he was hired by the Office of War Information. He was still living in his Grove Street apartment when he died at the age of 56 in August 1944. In the building at about this time was the young lawyer Emanuel Popolizio. He took on a high-profile case in June 1946 that made newspapers nationwide. His client, Henry Suckow was 24-years old. On June 8 he and two other army vets went on what The New York Times deemed a "rampage of violence." They murdered 20-year old Jack Hylands then raped his 18-year old female companion in Central Park. The trio then headed to Queens where they spotted 24-year old Antonio Marchisella sitting in the car of his friend, Charles Duff on Shore Road. They fatally shot Marchisella, pushed his body into the curb, then drove off with Duff before beating him and pushing him out of his car. Ironically, like themselves their victims had served in the military during the war. Little-known attorney then, Emanuel Popolizio would become a familiar name when Mayor Ed Koch appointed him head of the New York City Housing Authority in January 1986. He held the position through November 1990. In the meantime, life at No. 22-24 Grove Street continued relatively quietly. But, of course, there were exceptions. Security in apartment buildings at mid-century was lax at best. When Marian Sawyer came home on a cold Thursday night in January 1954, she was followed by a young man who threatened her in the hallway with a knife. He took $21 from the terrified young woman. Her attacker, Adam Perelman, was responsible for several other similar robberies. He was arrested a few days later. Shockingly, the 17-year old was the son of the famous humorist and screen-writer S. J. Perelman. Unlike many other apartment buildings of its size, however, such incidents were rare. Residents came and went quietly for the next half century, drawing little attention. And through it all H. I. Feldman's striking Art Deco design survived unchanged--a delightful addition to the architectural grab bag along the block. The rusting Church Street facade is identical to the Walker Street elevation. The neighborhood around Church and Walker Streets in the 1840s was still an respectable residential enclave. The wealthy Verplanck family spent its summers in their ancestral home near Fishkill, New York, which may have prompted them to offer their city home for lease on April 7, 1843. An advertisement appeared in The New York Herald that read "To Let--the three story house 34 Walker st, between Broadway and Church st, an excellent situation for a genteel family, occupied by Mr. Verplanck." Around the corner, at No. 309 Church Street, was a three-story wooden house. But as always was the case in New York, the district was to change. On March 13, 1866 the Walker Street address appeared on the Metropolitan Board of Health's list of "filthy locations." That same year architect and civil engineer E. J. M. Derrick left his position with the Erie Railway. He had designed railroad stations and related structures for the firm. On October 6 he advertised his new architectural office at No. 119 Broadway. Among his first commissions would be an L-shaped loft building on the site of the old Verplanck house and the frame building at No. 309 Church Street. John F. Delaplaine had hired Derrick to design the commercial building, which was being built especially for dry goods merchants Heine, Huber & Company. Its cast iron facades were Italianate in style with large arched openings separated by simple pilasters. By using the same foundry molds for both elevations, Delaplaine and Derrick achieved unity in design (and saved money). Construction began in 1867 and was completed the following year. Heine, Huber & Company may have been over-optimistic when it signed the lease, for the firm's name quickly disappeared at the address. Simon Brill had operated his dry goods store from No. 327 Canal Street for years. In the summer of 1869 S. Brill & Co. moved to No. 34 Walker Street. Brill had branched into manufacturing and on September 11 that year advertised for "experienced operators for ladies' undergarments, in and out of the house." The term "out of the house" meant that women could do piece work in their own homes. S. Brill & Co. manufactured an array of women's apparel. Eight months later the firm was looking for "experienced operators on ladies' white dresses; also good tuckers." Another ad on December 15, 1872 reiterated that work could be done at home, but warned "no pay for poor work." By October 1875 when S. Brill & Co. moved to No. 48 Lispenard Street Asher & Redlich had been in the building for at least two years. The firm manufactured trimmings such as "ladies' silk collarettes and bows." Unlike Brill & Co., the company insisted that work be done on the premises. An advertisement on January 25, 1874 sought "first class operators on lace goods and rufflings, and experienced hands on Normandy caps; a few girls to learn about 15 years of age." Those teen-aged girls who hoped to learn the trade would be disappointed. The Financial Panic of 1873 claimed many victims and on October 15, 1875 The New York Herald announced that the operation of Asher & Redlich had been suspended with liabilities of about $70,000 (more than $1.5 million today). The following month another tenant, tie makers Daniel Deutsch and Jacob Schwab, declared bankruptcy. New occupants included Schoals & Howell, selling agents for the Lyons Silk Works in Paterson, New Jersey. The company moved its salesroom into the building in 1881, offering "handkerchiefs and dress goods." Cloak maker L. Koch was already in the building and remain at least until 1887. Another tenant was Tarlow & Baum, manufacturers and dealers in worsted and knit goods. On February 1, 1890 Tarlow & Baum failed, but was immediately reorganized as Tarlow & Hutsching, headed by Jacob Tarlow and Thold Hutshing. The men's optimism was short lived. They declared bankruptcy before the year was out. Their bad luck was echoed four months later when a sheriff's auction of the Royal Rubber Company was held. Its owner, Shelly Jacobson faced attachments of more than $15,000. The sale brought in less than $3,000. At the time P. O'Doughtery & Sons had been in the building for years. Importers of "linens, woollens, and shawls," the firm was established by Patrick O'Doughtery and now included his sons Francis and Daniel as partners. In order to facilitate their acquisition of Irish linens, the O'Doughterys employed a representative in Ireland, Charles Malley, who routinely traveled back and forth between Donegal and New York. Malley was a steerage passenger on the City of Rome when it docked in New York on June 21, 1891. He was shocked when General O'Beirne, the Assistant Superintendent of Immigrants refused to allow him to leave the ship. O'Beirne declared that Malley "had no money and was liable to become a public charge." Word was sent to P. O'Doughtery & Sons. A representative rushed to the dock, accompanied by two bondsmen for Malley. Despite the endorsement and the officer to post bond, O'Beirne was adamant. The New York Times reported that he "flatly refused to accept a bond in the case, and is reported as saying that no power this side of heaven could retain the man in this country." O'Beirne defended his decision to the newspaper's reporter, saying that the Irishman was most likely to become a financial burden to the city. When the reporter pointed out that P. O'Doughtery & Sons had offered a bond to ensure that did not happen, the immigration officer stood pat. The Times reported that he said that the law "made it discretionary with him whom to reject, and that he proposed to exercise the power in this case." Malley was sent back to Ireland. As had been the case with so many of the tenants in the building, P. O'Doughtery was forced to declare bankruptcy three years later. After having conducted his business for decades, the failure seems to have seriously affected the senior member. On January 20, 1894 The Sun reported that the 80-year old Patrick O'Doughtery was in poor health "and had not been at the store this week." Sorely abused and with one bay of openings bricked closed (most likely for a freight elevator shaft) the Walker Street side has lost most of the decorative cast iron elements of the storefront. The building continued to house apparel manufacturers and dry goods firms. In 1896 Hirsch Bros., makers of "wrappers," employed 4 men, 21 women and 16 teen-aged girls who worked 54 hours per week. At the turn of the century Kasin & Winokur produced skirts, S. Bonfield & Co. manufactured shirts, and Max Wolkovitch ran an underwear store in the Church Street store. Wolkovitch ran into serious trouble in September 1902 after 19-year old Frederick Blumenthal was arrested following a two-year investigation. Blumenthal worked in the underwear factory of Henry Lewis at No. 70 Wooster Street. Over a period of two years the factory had mysteriously been broken into and "thousands of dollars worth of goods" disappeared. Police were baffled. There was never any evidence of forced entry. After Blumenthal's arrest it was discovered that he had made a wax impression of a key and had a duplicate made. Police explained he would "return to the building after the close of business and pack the most valuable goods he could lay his hands on and drag the packages to the front door." A truckman would remove the cartons to a storage place. Once discovered, the teen-aged crook named his accomplices. On September 13 Max Wolkovitch was arrested for receiving the stolen goods and selling them in his three stores, including No. 309 Church Street. The store on Walker Street was home to Louis Feinberg's clothing shop. He took a page from Wolkovitch's book when he sold overalls stolen from Sweet, Orr & Co. on January 10, 1906. Feinberg enraged Judge O'Sullivan when the case came to trial on June 29. The Assistant District Attorney asked him "Did you ever buy any such goods, bearing the marks of Sweet, Orr & Co.?" Feinberg replied "I don't remember." O'Sullivan ordered him to answer the question and when Feinberg's attorney objected, the judge erupted, saying in part, "I will not allow you or anybody else to trifle with the court...I know that man [pointing to Feinberg] is lying. No technicality of law can ever prevent me from preventing perjury from being committed here. I would rather surrender my seat on the bench and go back to my practice than allow it." The New-York Tribune reported "The witness seemed to wilt, and under further questioning answered that he had bought goods of this quality, bearing the name of Sweet, Orr & Co."
The following year, on July 13, 1906, M. Siegler & Sons, dealers in "woolens, silks, and cloaks," joined the long list of tenants that declared bankruptcy. But this one would end in scandal. After $54,000 in assets were found missing by December 1 an investigation revealed that Siegler and his sons had "drawn personal checks for $23,000; that ten days preceding the failure the Sieglers cashed checks payable to themselves for $10,300 and sold all their accounts for $6,000," according to the New-York Tribune. On August 16, 1909 Max Siegler was arrested after disappearing to Massachusetts. By now the total amount he and his sons had embezzled from their failing firm was calculated at $94,000--more than $2.5 million in today's dollars. While dry good and apparel firms continued here, following World War I the building saw other tenants as well. In 1920 Western Union had a branch office here. An advertisement on February 16 targeted "Thoughtful Young Women" who "like to employ their minds as well as their hands. The day is short when the mind is interested. The new method of handling telegrams--Automatic Telegraphy--requires intelligence as well as finger dexterity. The work possesses ever-changing interest. The is good. The occupation is esteemed." In the 1930s Blanco Trucking Company had its offices here, replaced by Hochman Trucking Co. in 1944. By then the Rose Roth Shoe manufacturing firm was in the building. Mid-century saw Mam'selle Lingerie, Inc., Paramount Textile Mills and To-Dee Textile Co. in the building. As the 20th century rolled over into the 21st, Boltex Textiles leased much of the space in the building. Today, at a time when Tribeca enjoys its rediscovery and venerable loft buildings have been restored and refurbished, this rust-covered 1868 cast iron survivor still suffers irresponsible neglect.